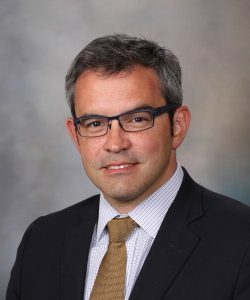 Professor of Medicine: at the Mayo Clinic in Rochester, Minnesota, USA, Dr. Montori is currently a principal investigator of the Knowledge and Evaluation Research (KER) Unit and is a recognized teacher of evidence-based medicine, promoting the ideals of incorporating the best available research evidence, the patient context, and the patient values and preferences in making clinical decisions. He has been an active contributor to the Users Guides to the Medical Literature. Areas of expertise: Evidence-based clinical practice, Shared decision-making, Minimally disruptive medicine, Systematic reviews and meta-analyses. Research program: The research of Victor M. Montori, takes place in the Knowledge and Evaluation Research Unit at Mayo Clinic. Dr. Montori is interested in how knowledge is produced, disseminated and taken up in practice — and how this leads to optimal health care delivery and patient outcomes.